I'm searching for a way to have a quick method of applying two different actions to each word within a text. I currently try do design a UI to help myself learn new vocabulary by reading texts. For this, I display a text and highlight each word which I do not know, yet. So, each and every word in the text will have two different actions which can be applied to it. This is an example text with some unknown words. Toggling a word between known and unknown - to my current experience - should be quick, because at the beginning of learning, text is mostly unknown. I also want to keep the option of leaving individual words unknown even if I read the whole text, because sometimes I cannot find words in dictionaries and do not understand it from the context. However, like this I cannot bind the vocabulary lookup to the word itself, anymore. My current idea is to have a small tooltip on hover which displays a button for vocabulary search and possibly another button for "mark word as read" (for people who do not know the direct click option). 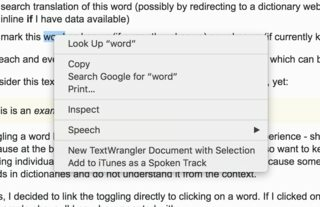 Is there a better way to let a user apply my two actions two each word (quickly)? I'm concerned about a couple things in your solution. (1) Keep in mind that stray clicks happen. As people mouse around they sometimes touch the mouse button enough to click things they didn't intend to click. So every word you can mark as known has to also be markable as unknown. It looks like you're already planning for that. (2) You mention tooltips on hover. Your hovers will need a bit of a delay. (That is, they can't be mouseovers.) Otherwise just passing the mouse over the text will show an explosion of tooltips and make people like me want to throw the computer out a window. Not the answer you're looking for? Browse other questions tagged buttons text tooltips speed or ask your own question. How to place text and a gallery side by side without giving more relevance to one or the other? Are there guidelines for when to use UPPERCASE, Capitalize Each Word, or Only the first letter?